For the first time in two years, a replacement satellite is en route to bolster the U.S. military's Global Positioning System constellation following a successful launch Wednesday that was dedicated to the heroes of September 11. The $40 million GPS 2R-8 spacecraft was delivered into orbit by a Boeing Delta 2 rocket after a smooth countdown and on-time liftoff at 1:06 p.m. EST (1806 GMT) from pad 17B at Cape Canaveral Air Force Station, Florida. "We believe the GPS spacecraft is going to play a huge role in the war on terrorism, so we are doubly excited about this launch, not only to sustain the GPS constellation but to aid our war fighters around the globe," said Air Force launch director Lt. Col. Brad Broemmel. The Lockheed Martin-built GPS 2R-8 satellite -- also known as SVN-56 -- will be maneuvered into the GPS constellation's Plane B, Slot 1. It is expected to enter service around February 17. The new craft will replace the GPS 2A-18 satellite -- also known as SVN-22 -- launched 10 years ago next week. The ailing satellite will shift positions in Plane B and retire, the Air Force said. GPS satellites operate 11,000 miles above Earth to provide precision location, speed and timing information to military forces and civilian users anywhere in the world. Smart bombs also rely on GPS signals to reach their targets. "We're proud to serve our country by supporting the American fighting forces and our allies around the globe against the war on terrorism. The GPS satellite will continue to provide the most accurate position, time and velocity information available to man," said Col. Allan Ballenger, the system program director for GPS office at Los Angeles Air Force Base. The GPS network features 24 primary satellites split into six orbital planes with four spacecraft in each. Some planes also have an additional satellite to serve as backup. Not counting the new GPS 2R-8 satellite, the orbiting system currently has 26 working craft. 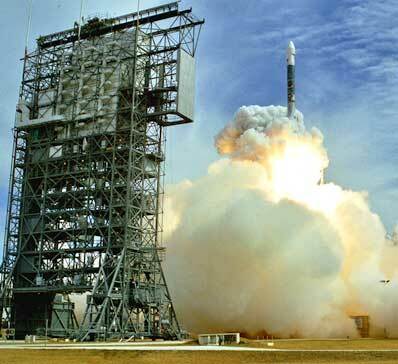 Started in the 1970s with developmental satellites, the operational GPS system used today began with Delta 2 rocket launches in February 1989. 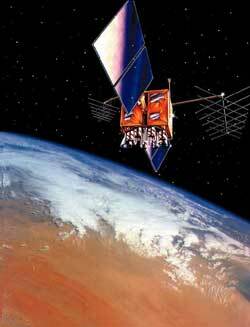 Thirty-six operational GPS satellites have flown to date with one launch failure -- in 1997. This was the first GPS launch since January 30, 2001. The lull between deployments was a combination of a healthy constellation and rocket-related postponements. "Over the past several years we have been able to delay some planned launches because they weren't needed because the current constellation was able to support the user base that we had out there," said Ballenger. Some satellites are over a decade old and still functioning, which is well above the planned life expectancy. Although several are running on backup systems, officials say the satellites are doing the job. "They have just astounded us in their ability to live beyond their design life," Ballenger said. Two more GPS satellite are slated for launch in the coming months from Cape Canaveral -- one on March 29 and one on July 18. "We are coming upon that point where we had a fairly aggressive launch schedule to achieve our full operational capability in 1995. Those satellites are aging and we need to have a proactive plan to replace and replenish that constellation," Ballenger explained. "We have some excellent mathematical modeling of the statistical failure rates of individual components that roll up the failure rates of individual satellites. And we use that to guide our decision paths in estimating how many replenishment satellites we'll need in the course of the next 6 to 12 months." There are 13 more replacement satellites left to send up in the current GPS satellite series. Up to eight of the spacecraft are being modernized to carry two new military signals and a second civil signal to improve the GPS system's capabilities. The first GPS 2R-M launch is expected by summer 2004. Hitching a ride on the rocket's second stage is the Experimental Spacecraft System-10 craft -- a 62-pound experimental micro-satellite for the Air Force Research Laboratory. XSS-10 was scheduled to separate from the spent rocket body about 16 hours after liftoff and perform autonomous maneuvers for several hours using newly-developed guidance and control software. "The XSS-10 is the first in a series of future micro-satellites the Air Force plans to use for inspection, rendezvous and docking and close-up maneuvering around other space objects," said Thom Davis, the program manager from the Air Force Research Laboratory. The $100 million XSS-10 project was developed to demonstrate a lightweight propulsion system, the new guidance software, a miniaturized communications system, lithium polymer batteries and a combined camera and star sensor. "It represents an essential advancement in space research and technology and will pave the way for future, low-cost, on-orbit servicing and other space missions," Davis added. The XSS-10 flight was expected to end within 24 hours of launch when its batteries would die. For Wednesday's launch, the Delta 2 rocket's nose cone was adorned with a "Let's Roll" emblem to honor the heroes aboard the commercial airliner that crashed in Pennsylvania on September 11, 2001. Authorities believe that plane was headed for Washington, but the passengers fought against the hijackers to prevent the aircraft from ultimately striking the White House or Capitol. "This will be our special tribute to the men and women who gave their lives in defense of this country on September 11. As many of you recall, Mr. Todd Beamer said those words to his wife on his cell phone. He led the revolt on Flight 93 that represented the first counter-offensive by America on the war on terrorism. So this is of significant importance to all of us. 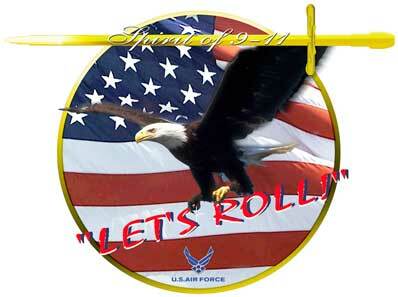 'Let's Roll' captures the spirit of today's military -- people who are ready, trained and they stand up and say 'send me,'" said Broemmel. Each Air Force base was permitted to have one vehicle with the tribute artwork. 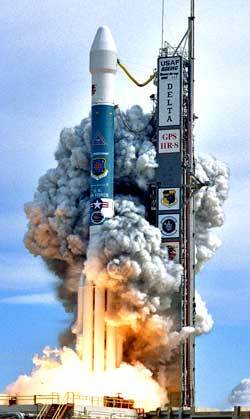 This Delta 2 rocket was selected due to the GPS' continued support of the troops overseas fighting the war on terror. "Putting the artwork on the Delta 2 rocket was our way to increase awareness within America and other nations of the need to combat terrorism, and the important role the GPS satellite plays in the war on terror," said Capt. Joy Meade, the project officer from the 1st Space Launch Squadron at Cape Canaveral. The art design was created by Senior Airman Duane White, a journeyman from Air Combat Command's multimedia center at Langley Air Force Base in Virginia. Global Positioning System - Description of the U.S. Air Force's space-based navigation network. GPS constellation - Chart shows the current status of the orbiting GPS satellite fleet. XSS-10 - The experimental microsatellite flying as a secondary payload on this launch. Delta 2 rocket - Overview of the Delta 2 7925-model rocket used to launch GPS satellites. 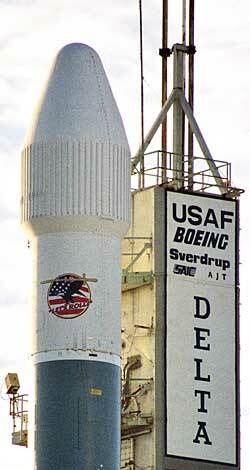 SLC-17 - The launch complex where Delta rockets fly from Cape Canaveral. Delta directory - See our coverage of preview Delta rocket flights.